Barefoot Permaculture has designed and created an outstanding demonstration permaculture farm in Turkana East near Lokichar. We were invited up to the farm last November to help train their staff on how to sustainably prune tree branches to make eco friendly charcoal for baking and cooking the farm produce. We also conducted a training session on how to make wood vinegar by condensing the smoke during the charcoal making process to make an organic pest control agent. The current charcoal making industry and techniques around Nakukulas Village Turkana East: The charcoal industry in and around Nakukulas Village is a reasonably small but vital business. This is especially true for more vulnerable groups as dry season charcoal making is an important drought coping mechanism that generates much needed emergency income with very little capital expenditure. 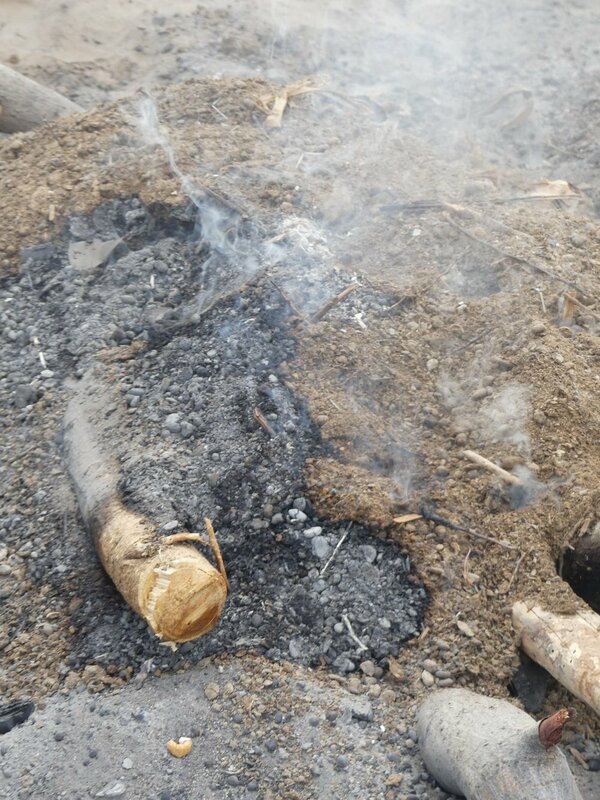 Traditional charcoal making in this area is heavily reliant on pruning branches from the indigenous dryland trees, mostly the acacia tortilis, or using dead wood from trees that are intentionally bark ringed, burned, or destroyed in floods (see Photo 1). The more common method of charcoal making in this area is to use goat manure, due to the lack of grass and sandy soils, to cover the wood to make a traditional mound type kiln to make charcoal. 2. High calorific value - Goat manure kilns can create a potentially higher calorific value charcoal than kilns covered in pure soil due the energy provided to the pyrolysis process from the manure itself. 3. Low impact - the traditional tree pruning methods (removing branches and leaving the tree intact) have less impact then clear cutting whole swathes of trees as seen in other parts of Kenya. 3. Inefficient combustion – Potential for high loss of charcoal to ash and flare-ups from strong winds (blowing the goat manure off and increasing oxygen flow to the combustion). This scenario is dangerous to livestock and children. 4. Lack of local government recognition - local charcoal producers’ associations can help with upgrading skills of the charcoal producers, better access to markets, and increased exposure to charcoal making technologies and reafforestation practises . 5. 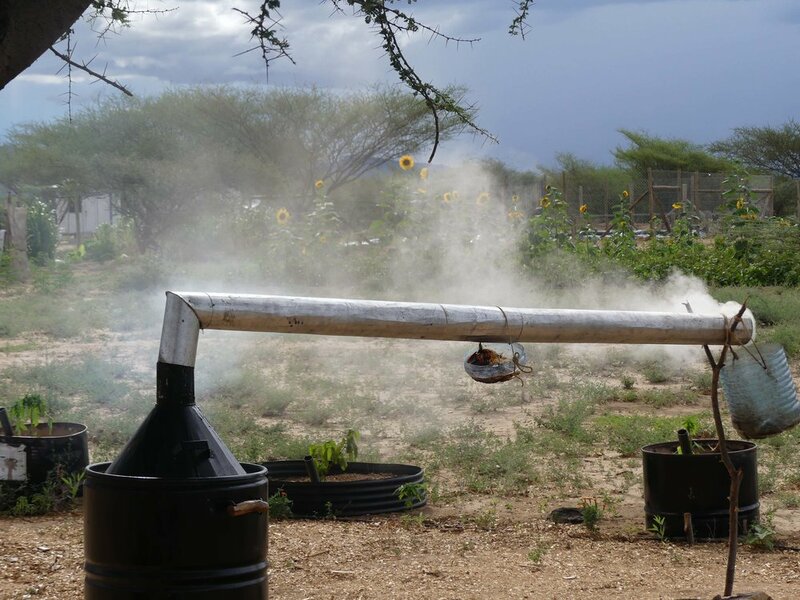 Loss of vital soil nutrients - burning manure as well as the growing propensity to kill and use fully grown trees as the demand for charcoal in the growing towns of Kitale, Eldoret, Bungoma and Lodwar increases. On the 6th of November 2017 we conducted a sustainable charcoal making and value addition course at the Akiro Amana Farm outside of Nakukulas Village. 1. 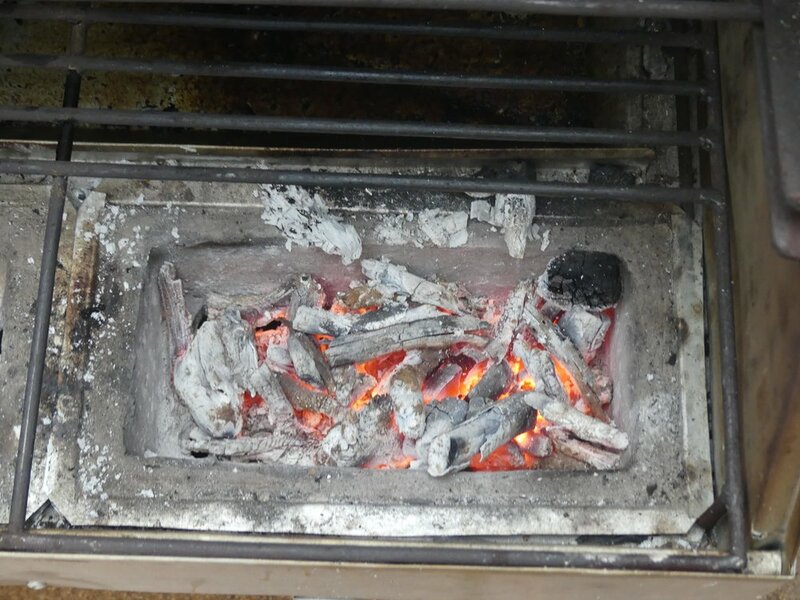 How to use and operate a Cookswell charcoal kiln. 2. How to make a batch of charcoal using smaller tree branches and building off cuts. Above: Charcoal making demonstration with the Barefoot Solution team using a Cookswell Jikos kiln. Above: Harvesting wood vinegar (liquid smoke in a Cookswell Kiln. 4. How to coppice trees with correct tools so that one does not damage the trees when processing the feedstock and where/how to cut branches to make charcoal without killing the tree. 5. 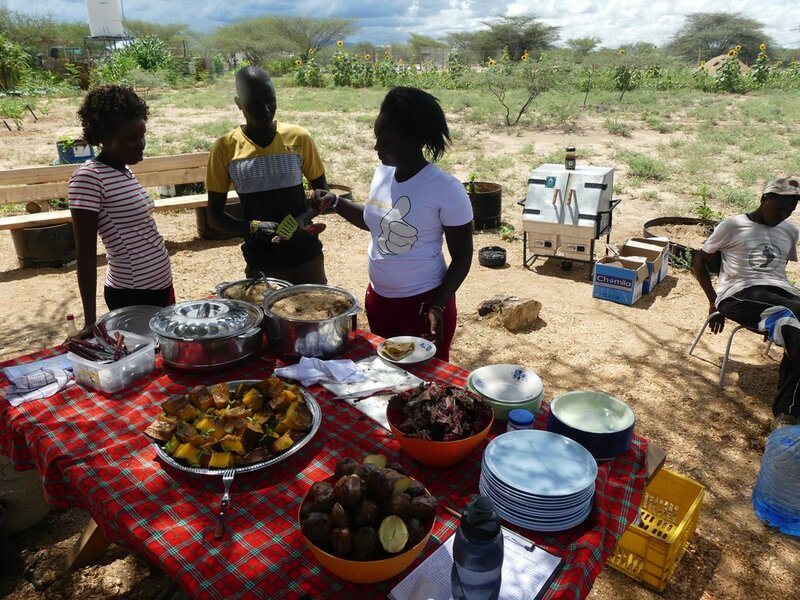 Charcoal and farm produce value addition and improved nutrition using a Cookswell Charcoal Oven to bake, roast or steam food. Above: Baked quiche and roasted sweet potatoes in a Cookswell Charcoal Oven. Above: Roasted squash and baked bread in a Cookswell Charcoal Oven using the branch charcoal. 1. We recommend that the charcoal making activity, especially processing the feedstock, undergo a small localized cost/benefit analysis to further investigate true local production costs in regards to labour versus output. To this end I would suggest that the harvesting of branches and cutting them up be timed and the wet and dry weight of the wood and final charcoal and wood vinegar production be recorded over a 6 month period of intensive charcoal production. This data can then be used to extrapolate future industry growth. 2. We highly recommend implementing options for value addition to the charcoal production. For example, opening a small bakery for value addition to the charcoal and to the food crops. A business bakery training course can be organised from the https://amaribakery.com/ based in Nairobi who have had many years experience setting up profitable community based bakeries all over Kenya. We would like to extend a very hearty thanks to the whole team at Barefoot Solutions for this very interesting experience demonstrating our products and expertise in a new part of the Kenya. Come visit us in Turkana for a full hands- on experience on our demonstration farm by applying for our apprenticeship program here. DON’T CHOP DOWN TREES - JUST USE BRANCHES! Recovery of chemicals from the vapours given off when hardwood is converted to charcoal was once a flourishing industry. However, as soon as the petrochemical developed, wood as a source of methanol, acetic acid, specialty tars and preservatives became uneconomic. But with the advent of higher prices for organic food and organic living, wood vinegar is making a vigorous globally resurgence. Wood vinegar is another name for pyroligneous acid and is the crude condensate of smoke that consists mainly of water. The non-water component consists of wood tars, both water soluble and insoluble, acetic acid, methanol, acetone and other complex chemicals in small amounts. When left to stand, the pyroligneous acid separates into two layers comprising the water insoluble tar and a watery layer containing the remaining chemicals. • Repel nematodes – Tomatoes, 1:500 (apply to the base of plants); strawberries, 1:200 (apply to the base of plants); and black pepper vines, 1:1500 (apply in place of water). • Repel insect pests – Cabbage and Chinese cabbage, 1:1500 (apply in place of water); corn 1:300 (spray onto leaves). • Control of fungal diseases – Tomato and cucumber, 1:200 (spray onto leaves). • Control of root rot – Tomato and cucumber, 1:200 (apply to the base of plants). • Reduce incidence of chili pepper flowers aborting – 1:300 (spray onto leaves). • Improve flavor of sweet fruits and stimulate development of crops. Mix solution rates of 1:500 to 1:1000. Wood vinegar prevents excessive nitrogen levels, improves plant metabolism and contributes to higher fruit sugar levels. • Stimulate compost production. A solution rate of 1:100 will help increase the biological activity of various beneficial microbes and can decrease composting times. • Combat bad odor. A wood vinegar solution of 1:50 will diminish the production of odor-causing ammonia in animal pens. • Supplement for livestock feed. Mixed with livestock feed at rates of between 1:200 and 1:300, wood vinegar can adjust bacterial levels in the animal digestive tract which improve the absorption of nutrients from feed. • Enrich garden soil. Use a strong solution of 1:30 to apply to the garden soil surface at a rate of 6 liters of solution per 1m² to enrich the soil prior to planting crops. To control soil-based plant pathogens, use an even stronger rate of application. Nikhom reports that wood vinegar yield per metric ton (2200 lbs.) of air dry wood is appx. 314 kg (690.8 lbs.). The product contains approximately200 components. Your own homemade wood vinegar will vary depending on the feedstock used, moisture content and carbonization time. We recommend you do trials before large scale use.